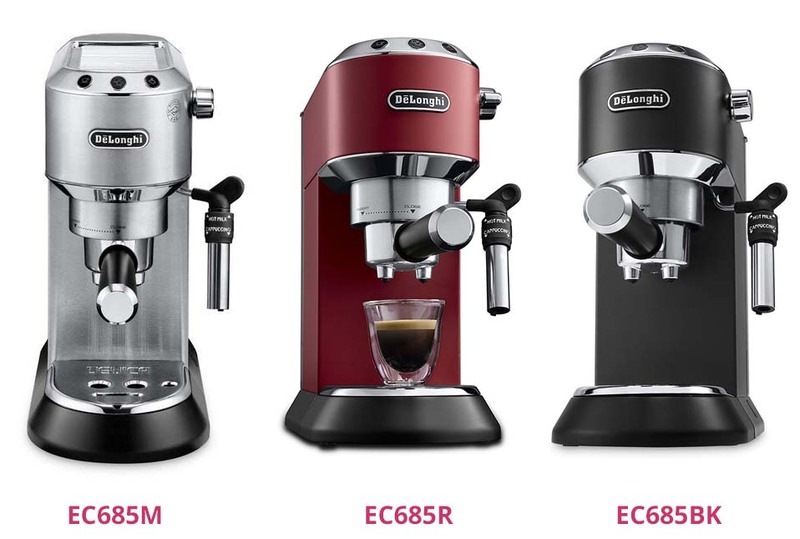 The De’Longhi Dedica (EC685M, EC685R, RC685BK) is an ever popular choice among home espresso machine buyers – and with good reason. Coming in at under £150, the machine blends stylish looks, high performance and usability batter than most machines on the market at this price point. 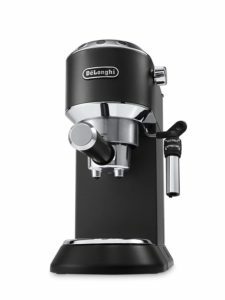 The De’Longhi Dedica produces excellent results at what is a extremely competitive price point. In addition to the quality of the coffee produced, it also looks great and is available in three different colours. There are some minor gripes in operation however. Initial programming and set-up is a bit fiddly, the clearance height for cups is pretty low – meaning that larger mugs or longer coffees require some faff in decanting between smaller cups – and cleaning can be a tad messy as the used grounds are loose rather than a compacted puck. But at this price you can’t really complain about these things – and if top notch coffee is your prioirity then you won’t be dissappointed. Each machine comes with a one-litre water tank, a Panarello steaming wand and a selection of pressurized portafilter baskets. One basket for a double shot, one for a single, and one that can take easy serving espresso pods. The box also includes a measuring spoon-come-tamp thingy too – essentially everything you need to make Italian-style coffees. The machine can generate 15 bars of pressure, and thanks to the pressurized portafilter baskets, always delivers a rich espresso with plenty of smooth crema. The Pannarello steaming wand performs well, and we found it could heat enough milk for two cappuccinos and double it in volume in around one minute. Once you press the espresso button the machine automatically pre-infuses the coffee with water and churns it out after a couple of seconds of wait time. This also helps improve the quality of the final cup over machines in the similar price range that simply blast water through the coffee from the get-go. You also retain a degree of control over the coffee, as by holding down the buttons – and reading the manual very carefully – you can programme the water temperature across three ranges. You can also set the length of each standard pour to any size of your own choosing. If you are after a longer coffee, the Panarello wand also doubles up as a hot water dispenser meaning that you can have americanos on tap too. The Dedica comes with a hot panel on top for warming and storing your cups and a drip tray that is relatively easy to remove and clean. The product is available in chrome, black and red. The machine has nice soft lines and has a real high-quality look to it. Each machine is in fact made from plastic, but coated with stainless steel panels which look great. They really make it stand out when compared to other plasticky looking models which are sold in the same price bracket as the Dedica. Another very striking thing about the machine is how narrow it is. Coming in at just 20 centimetres wide, the De’Longhi Dedica will fit onto even the most cramped of kitchen counter-tops. Using the machine could not be simpler. There is one button for a single shot, one for a double and another to operate the steaming wand. That said, programming the thing can be tricky, as it involves holding down buttons until they flash. There is no interactive display here so you feel like you are groping round in the dark and some trial and error is involved. Once you get it right, you’ll find you can also tell the machine to descale itself – which it does by running water (to which you need to add descaling solution) through the machine in bursts. Another, slightly irksome thing about the machine is that its pressurized portafilter baskets – which contain fewer holes than standard – don’t produce a hardened puck of coffee once they have been used. The result is a watery mix of grounds and coffee, which makes cleaning slightly more arduous than it should be, as you run the risk of spilling a soup of coffee grounds over the kitchen counter-top after use. Another, albeit minor, consideration is that the clearance height between the portafilter and drip tray is very low. No mugs will fit, and neither will most demitasse cups either, although some can just squeak in there. This obviously adds an extra faff to proceedings when you are going for anything longer than an espresso. Finally, the coffee tamper + scoop is awkward. Why not just have two separate things?! Minor gripes aside, this is a very good machine at a very attractive price. Yes, cleaning and programming can be a bit of a faff – as can longer coffees, but the machine is very easy to operate once set up. It looks far more expensive than it actually is and takes up next to no space in your kitchen. The coffee produced was always delicious, and the milk frother has enough juice to quickly make delicious, silken cappuccinos. It’s a great buy for any coffee lover who doesn’t mind the fact that making a cuppa can be a bit of a ritual.